I’m so pleased to be included in the exhibition SHOW.19 at Idea Exchange with a really good roster of artists. The show runs from May 10 - June 29, 2019 and is curated by Iga Janik. […] “voice to the most ambitious and dedicated”. Oh geez. Better keep moving! I asked a group Canadian artists to share a recipe with me. I’m putting together a cookbook with their generous offerings. I’m hoping this venture will help me develop my culinary skills but also I’m nosey and wanted to know what others were having for dinner. The recipes will be part of a publication that will be available in the fall. Everyone’s been so nice about this! I have an exhibition called period of adjustment which opens May 10 at the Niagara Artists Centre. It’d be wonderful to see you at the opening reception! There will be also an artist talk some time in the summer so hopefully I’ll see you twice. The exhibition runs until August 17, 2019. The material applications on Over My Dead Body is complete. This weekend I scrubbed off most of the past 6 months worth of mark making with muriatic acid. The final step will be to concrete over all of this and sand each tile down. Thanks Ontario Arts Council for the on-going support! New video kicking around on the website. Check it out. New screen print with correction fluid and spray paint, 30 x 22”, 2018. Miraculously after 7 months of form building, having two transport trucks drop off materials and hand-pouring 4,200 lbs. of concrete, the first phase of Over My Dead Body is complete. That was hard. I have always taken the weather personally, 10/15 VE, will be part of the juried exhibition at the Grimsby Public Art Gallery. Thank you to Marla Panko, Stephanie Porter, and Mary Rashleigh for your support. So wonderful to have been included in Deathnastics, as part of Gymsick, curated by Hazel Meyer and Lucy Pawlak, Bunker 2 Contemporary Art Container. The project was generously funded by the British Arts Council and the Social Sciences and Humanities Research. You can read a bit more and find links by clicking here. I have two prints, I have always taken the weather personally, 10/15 and 14/15 VE included in the Glenhyrst Art Gallery of Brant summer exhibition. Thanks Stephanie Radu, Jenna Faye Powell and Matthew Ryan Smith for including this work. The exhibition runs July 28 – September 23rd, 2018. The last few weeks I've been breathing new life into an unresolved screen printing project from last year. First day of pouring concrete for a new project. Kirsty's such badass help. Open Studio's Members' Ink takes place May 3, 2018, 6-9pm. Members’ Ink is a silent auction of original fine art prints—including etching, lithography, relief, and screenprints—by Open Studio artist members. This fundraising event supports their programming, including exhibitions, education, residencies, and professional development and studio access for artists. Kids Fest is Done for Another Year! This year Kids Fest, an outreach program of Tangled Art + Disability, exhibited artworks created by the students at Giant Steps. Giant Steps is a school and therapy centre for elementary school-aged children with Autism Spectrum Disorder (ASD). Their programs are tailored to each student’s needs encompassing academics, speech therapy, behaviour therapy, occupational therapy and daily living and social skills training. The works on display in ‘Colours of the Spectrum’ were produced over four workshops with projects providing an opportunity for the young artists to experiment with materials and processes outside of their typical approach. I received a Canada Council for the Arts, Professional Development grant that will provide funds for training in web-based platforms. New year, new video in the works. 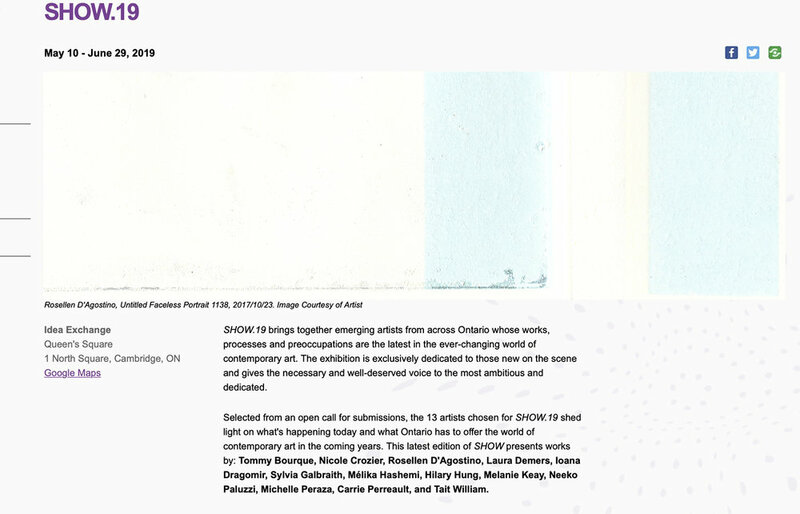 I'm thrilled to have received a Toronto Arts Council 'Emerging Artist' grant. This grant will provide space and materials for an ambitious new project that will start in the new year. 'll have some greeting cards available at Open Studio starting November 30th during the Artist Proof Sale. The cards will be for sale throughout the year and are in support of Open Studio's operations.